Ok, the game is tonight instead of Friday night but it’s close enough to Halloween. The #2 Florida State Seminoles bring their incredible 23 game winning streak into Papa John’s Cardinal Stadium to face the Cards for the 15th time. FSU will be playing for their 13th win in the sereies. With the new playoff selection committee releasing their rankings Tueasday night, the ACC has 4 teams ranked without counting Notre Dame. The Louisville Cardinals #25 ranking only adds to the excitement of this game. The Noles have had some bad luck on Thursday nights & have fans wondering of a curse. They are 9-5 on Thursday nights but have seen some freaky things that have lead to losses, like having a RB run into their QB causing a fumble. Louisville on the other hand has had great success at home on Thursday night. They have won 9 straight Thursday home games, including a 26-20 overtime victory over #3 FSU on 9/26/2002. Also included in the streak is a win over #3 West Virginia in November of 2006. You have to go back to October of 2000 to find their last Thursday home loss, 28-25 to ECU. To find the last ranked team to beat the Cards at home on Thursday night though you have to look all the way back to September 5, 1991 when #11 Tennessee came to town. That was 23 years, 6 coaches, 4 conferences & a stadium ago. The Cards have used Thursday night games to help build its football brand. Tonight game will pit each teams strengths and weaknesses against each other. The Noles potent offense will go head to head with one of the nation’s top defenses. The Cards defense is #1 in total defense (245.8 ypg), run defense (2.31 ypc), 1st downs (13 pg) & red zone efficiency (30%). They are #2 in yards per play (3.91) & 3rd down conversion rate (24%). They are also #4 in scoring average (14.6) & #5 in sacks with 28. Gerod Holliman is tied for #1 in the nation with 8 interceptions. David Hale of ESPN compiled these stats for Jameis Winston when the game is tied or with the Noles trailing, 144-199 (72%) for 1860 yards (9.3 yp att), #16 TDs & 4 INT. Winston knows how to win & that is one reason why he is the premier player in college football today. The Noles defense has struggled this season while the Cards offense has been disappointing though the Cards are getting healthy. The Cards top 3 WR’s in Devante Parker, Eli Rogers & James Quick have only been on the field together at the same time for just 1 Qtr all season. Michael Dyer is starting to get stronger in practice & looking more like his freshman season form. Dyer rushed for 173 yards & a TD vs NC State in their last game. Parker made his return in that game as well and gathered 9 receptions for 132 yards. This all should help cure the Cards offensive ills going forward. FSU holds a 12-2 advantage in the series with the Cards winning the first meeting in 1952 41-14 & the last in 2002. That 2002 game was played in the remnants of a hurricane & ended with victorious Cards fans storming the field and carrying the goal post down Floyd Street. Just say the monsoon game & everyone knows what you are talking about. It shouldn’t rain tonight but it will be cold with the lows in low 40’s or possibly upper 30’s. For those going to the game expect traffic to be a nightmare with the FFA convention at the fairgrounds & racing at Churchill Downs. To make things worse there is talk of former President Bill Clinton being in town for a campaign rally in a local US Senate race. If the Cards new uniforms for tonight game isn’t scary enough for you they will be playing the Halloween theme music on 3rd downs. This has the makings of an exciting match up and the atmosphere should be electric enough to give the undead a pulse. I’ll take a sip of witches brew and predict a 34-31 Cards victory. Tune in tonight at 7:30 on ESPN if you dare. 9 Straight Thursday Night Wins, no loss at home on Thursday since Batman was played by Michael Keaton (only 1 time at this point)… I would say that UL is due for a slip up… but then I look at my noles and realize they will lose by 11. Louisville has been tough to beat at home on Thursday night, we can thank ESPN for helping us build our football brand. It should be an exciting game tonight. FSU always seems to find a way to win & yet somehow they seem to be the underdog with the nation seemingly siding with Louisville. The Cards are better with the underdog role. Going up against the #2 team & defending national champs Patrino shouldnt have a problem selling that role to the team. 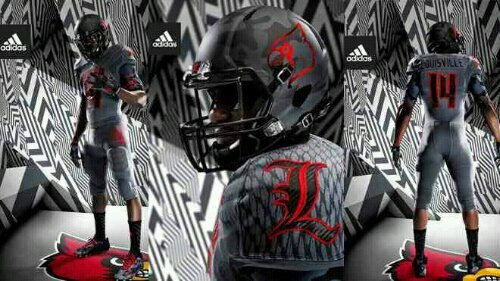 Why does the UL uniform look like a chain link fence design? Oh, those are feathers, but Cardinal’s are red??? It would look awesome if they kept the same feather/chain link design with light black lines but colored in rad. Maybe make it look darker or brighter in the tone of red. It’s a gray camouflage design. With our new deal with Adidas we get 5 new uniforms. They actually look better in person than they do in the picture but I would prefer our traditional colors. Can’t believe FSU won, and the way it did… Really thought it was over at 21-0… How many times can FSU come back like this? I still think they will lose somewhere before the playoff. No they wont, Winston wont let that happen. The better team won. It was a great game. We now know what we need to improve to get to an elite level. Its amazing how easy Winston makes it look. FSU defense really stepped it up in the second half as well. Cards well get you next year, lol.